Here at Coventry Animal Hospital, we have seen our fair share of cases of GDV. GDV (also known as torsion or bloat) is an emergency condition that occurs most commonly in large, deep chested dogs but can occur in dogs of any size. GDV occurs when the stomach fills with gas and then twists on itself. This is an emergency and life threatening condition since blood circulation is cut off by the twist and expansion of the stomach, which can lead to shock. What are signs of GDV? If you suspect your dog may have GDV, take your dog to a veterinarian immediately! 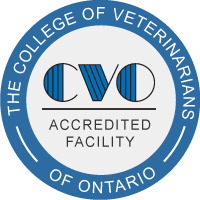 Your vet will perform a physical exam that may lead to highly suspicious signs of GDV. If your pet is stable enough, the vet will perform an X-ray to diagnose the torsion. If not, your vet will stabilize your dog by removing some of the gas from the stomach first. GDV is treated by emergency surgery to correct the position of the stomach. During the surgery, your vet will evaluate the condition of the stomach and spleen. The spleen is close to the stomach and may twist with it and be damaged. If the spleen looks damaged, it will be removed. The stomach will also be assessed. Any dead tissue of the stomach will have to be removed as well. The stomach will then be anchored to the body wall in a surgery called a “pexy” to prevent it from twisting again. Your pet will also receive emergency fluid therapy and other medications to help with shock. After surgery, your dog will require extensive monitoring as it can be prone to dangerous heart arrhythmias the day following. Unfortunately, prognosis is variable for dogs that get GDV. The only way to increase your dog’s chance of survival is by getting your dog to the veterinarian as soon as possible when you notice something is wrong. Stress is the only factor that has been consistently shown to play a role in dogs that get GDV, however that is not always the case. No other factors have been directly linked to it. In deep chested dogs that have a higher risk of bloat, a surgery called a “gastropexy” can be performed. This surgery involves anchoring the stomach to the body wall to prevent it from twisting. This can be done at the time the dog is spayed or neutered. Breeds prone to developing GDV include Great Danes, German Shepherds, and Standard Poodles.